Stabilisation - V - wobbly & erratic!!! Unstable!! On February 24th, 2017, the Balsamic Moon marks the last appearance of the current Lunar phase - (27th) in the past ancient astronomers/astrologers would pay particular attention to this phase to determine the coming lunation. 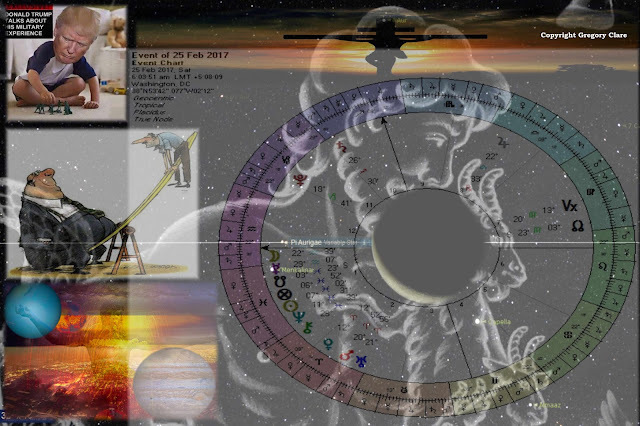 The next New Moon - 26 Feb, 2017, this new moon is a annual solar eclipse @ 8 degrees Pisces . The balsamic dark phase has connections to the preceding Lunation, which was a Lunar eclipse of 22 degrees Leo. The Balsamic Moon rising set for Washington DC, Feb, 24, see's the Moon rise @ 22 Aquarius, this is the exact degree of the Sun on the day of the Lunar eclipse, 10th Feb, 2017. Also of note is the rising degree of the Annual eclipse Feb 26th, 22 degrees Taurus. Add to this the Mars/ Uranus conjunction @ 21 degrees Aries, the Fall (depression) of Saturn and direct opposition Jupiter in Libra 21 degrees, . Now a picture starts to appear; events that were not completed under the lunar eclipse will be the focus of the upcoming lunation phase - solar eclipse. What is very interesting about this astronomical activity is the rising balsamic moon on Feb 24th, Washington DC, also has the Reddish super Giant Pi Auriga (constellation - Charioteer) rising in the dawn sky . Auriga was first catalogued by the Greek astronomer Ptolemy in the 2nd century. The constellation is the site of the galactic anti-centre, the point in the sky opposite to the centre of the Milky Way Galaxy. Pi Auriga is classified as an slow irregular variable of type LC and its brightness varies from magnitude. erratic childish behaviour is on display, a denial of the true state of consciousness ! Only this behaviour is coming from the Governing party of the US. And it is the world at large that will be challenged by this peculiar display. "A red rooster crows in the dawn sky"